Got a messy stained garage floor? Then we have the solution! Our garage floor coatings are attractive, chemical resistant and scratch resistant providing many years of protection for your concrete floor. Our garage floor coatings range from Epoxy floor coatings in a variety of colours to paint flake systems that look like terrazzo. These systems have 2 polyurethane top coats and are U.V stable. We do all preparation – grinding the concrete and filling any patches or cracks to ensure the finish is perfect every time. 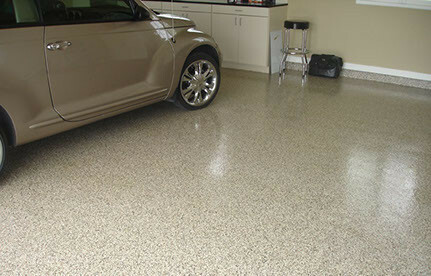 Your garage floor will look like new – in fact we believe that our solutions look better than new! Take a browse through our gallery and give us a call today and remember if you want the best Epoxy floor or Polyurethane floor then Conjoint Industries is the one for you.